Fire ripped through Paris' historic Notre Dame cathedral. A man from Wheatley, is in the city studying international business. He said everyone was quiet, just taking in what was happening. Wheatley's Quinn Bowman was out for a run when he found out Notre-Dame Cathedral was on fire. "There was a lot of tourists, no one was really talking," Bowman said. "People were kind of just in awe witnessing this. Locals were crying, praying on their knees, singing songs. It was an emotional day for sure." A roaring blaze devastated the Parisian landmark Monday. 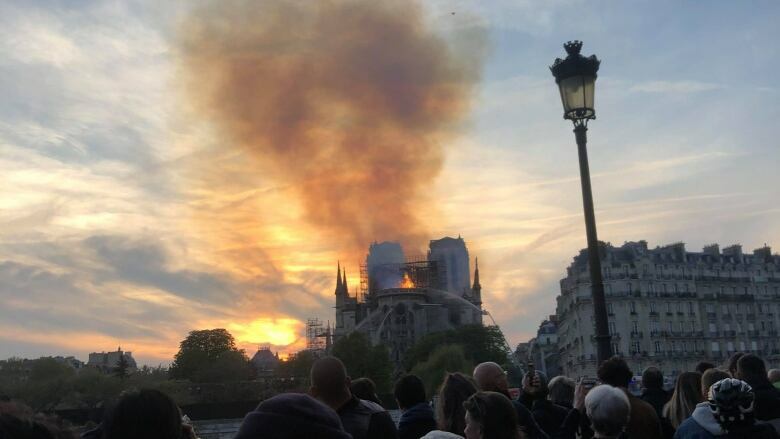 Flames that began in the early evening burst rapidly through the roof of the centuries-old cathedral and engulfed the spire, which collapsed, quickly followed by the roof. Bowman is in Paris studying international business. He tried to get closer to the cathedral, but said the bridges were closed off. He was able to take photos and move around the city to see it from all the possible angles. Police, paramedics and firefighters are on site, ensuring the crowds are kept away. The mood of the city changed, he said. Normally a busy city, people in Paris are always keeping their head down, focused on getting to their destination, said Bowman. "With an event like this everybody stopped and looked at it, witnessing this. It's such an iconic place in Paris and there's so much history there," he said. Bowman said "people are just grieving that this happened." Tap the player below to listen to Bowman's conversation with Chris dela Torre on Afternoon Drive.